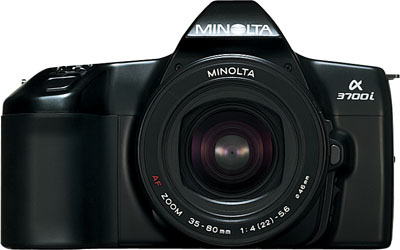 Minolta’s first water-resistant 110 camera. Editor’s note: this camera was better than water resistant by today’s standards – it could be used underwater in most swimming pool, snorkeling and swimming situations. Unfortunately the results from 110 film were terrible, as we ourselves found out, being unable to produce any example pictures which proved the camera to be worth buying! But it was great on the beach. The world’s first interchangeable lens rangefinder camera with aperture-priority auto exposure (the poster text gets this the wrong way round, hopelessly – “World’s first AE interchangeable 35mm FP camera with range finder”). 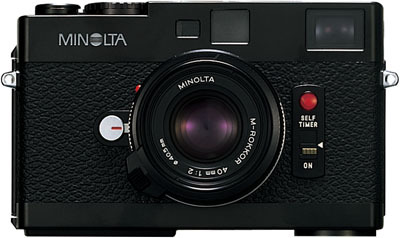 Editor’s note: the CLE was produced by Minolta after Leica decided to discontinue the CL model. It has a viewfinder with frames for 28mm, 40mm and 90mm instead of 40mm, 50mm and 90mm and Minolta produced a 28mm f/2.8 Rokkor-C wide angle in addition to 40mm f/2 and 90mm f/4 optics. This Japanese-made lens is now sought after by Leica owners for its compact size, low cost and high quality. 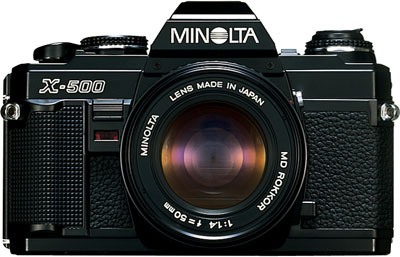 The 90mm f/4 lens, though labelled Minolta, was made by Leica. The CLE uses an electronic focal plane shutter and unlike the CL which was limited to 1/2 second can make brief auto time exposures. Program AE SLR and winner of the first ever ‘European Camera of the Year’ award from TIPA (the Technical Image Press Association) in 1982. 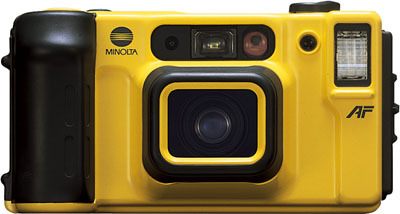 35mm leaf shutter AF camera with electronic shutter and built-in motor wind. 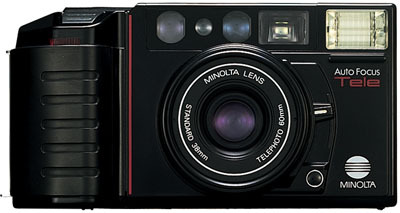 35mm leaf shutter AF camera – extremely compact design with sliding cover. 8 x 11mm images on Kodak’s 1982 Disc Film format. 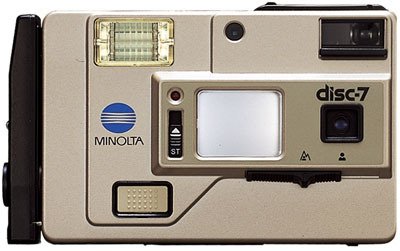 Minolta’s first Disc camera, with ‘combined lithium battery’. 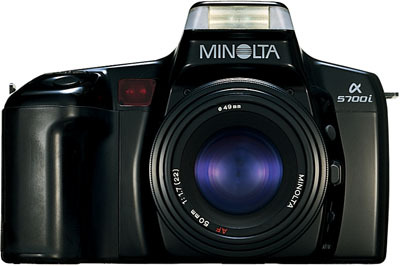 Minolta’s first 35mm SLR camera with built-in electronic focus detector. Ed: extremely rare item. Aperture priority AE SLR with TTL flash metering. 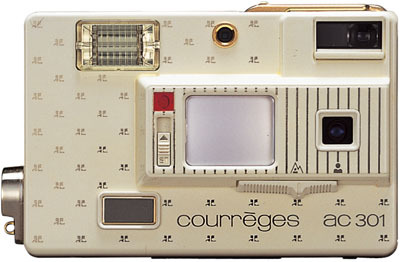 Disc camera designed by Andres Courreges. 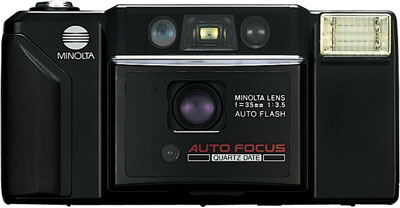 35mm AF leaf-shutter camera. Ed: the AF-E started a downward trend in having fewer AF steps and relying on depth of field. The ‘Freedom’ name eventually came to mean fixed-focus cameras little better than old box cameras in terms of exposure or focus control. This model, at this date, was still reasonable well featured if extremely ugly. 35mm AF leaf shutter camera with voice warning. Ed: note the name – ‘Talkman’! They knew Sony was coming. 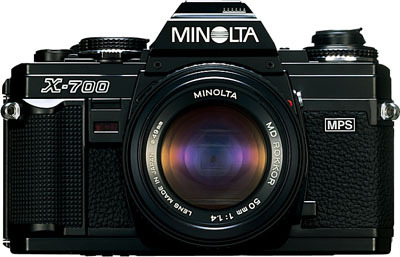 Notoriously bad marketing concept on Minolta’s part and the first of a continuing series of eccentric highlight features which left enthusiasts baffled. 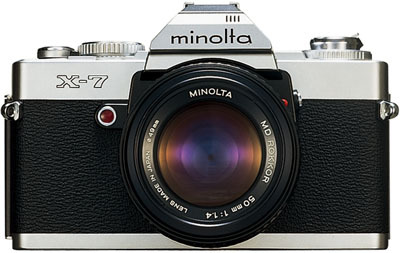 World’s first 35mm SLR system camera with integrated autofocus. Winner of the ‘Inter-Camera International’ award, ‘Camera Grand Prix 1985’, and European Camera of the Year 1985. All lenses and most accessories introduced with this new AF-mount lens system, completely changed from the previous SR/MC/MD mount models, remain compatible with today’s Konica Minolta and Sony DSLRs. 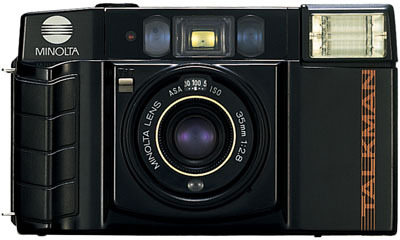 Note the Alpha symbol on the photographs of these Japanese market models, which were all known as Alpha in that market. The 7000 body should also be fully compatible with all the full-frame lenses to be introduced by Sony, except those using SSM (supersonic in-lens motor focusing). 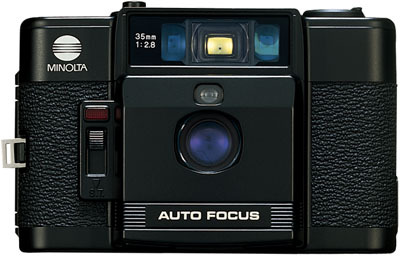 35mm leaf shutter autofocus camera with two built-in lenses, standard and telephoto. 35mm AF SLR camera with attachable exclusive 5 frame/sec motor drive. Ed: this is an understatement. The 9000 is a professional grade camera with manual wind-on unless an autowinder or motordrive is attached, unlike the 7000 with its built-in auto wind. It remains a benchmark design. 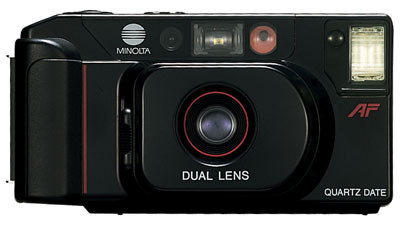 35mm leaf shutter AF camera with the largest magnification viewfinder (0.6X) in its class. For comparison, typical Leica rangefinder viewfinder magnifications range from 0.7X to 0.85X. Microcomputer controlled 35mm AF SLR. Ed: that’s what the poster caption says, so maybe it really did use a new type of internal control. For the buyer, much cut-down version of the 7000 with press-button operations to control adjustments, and no dials. 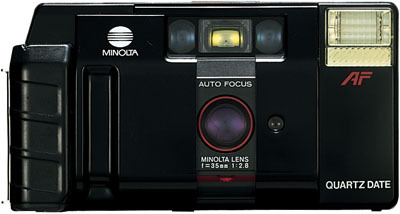 35mm leaf shutter AF camera with two built-in lenses, standard and telephoto, and the ability to take close-ups down to 52cm. 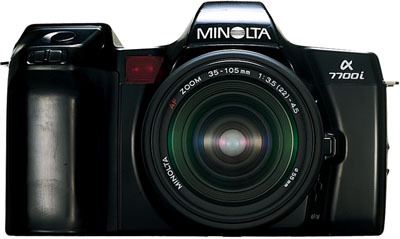 Minolta’s first all-weather 35mm AF leaf shutter camera. Ed: again, this can be used underwater. Results are a massive improvement over the 110. 35mm AF SLR camera with predictive focus control and intelligent card (that’s what the text says!). 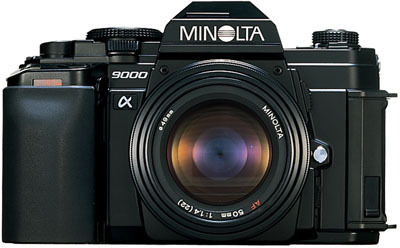 Won ‘European Camera of the Year ’88’ Award. This camera is the first to use the Creative Expansion Card system, optional function and customization ROM cards which slot into a bay on the camera under a door rather like a memory card door for a digital SLR. 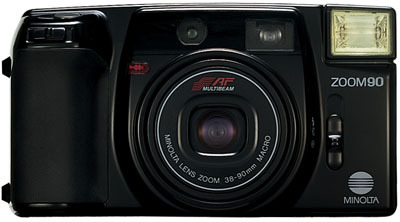 35mm leaf shutter AF camera with program zoom function. World’s smallest and lightest 35mm AF SLR camera when launched. 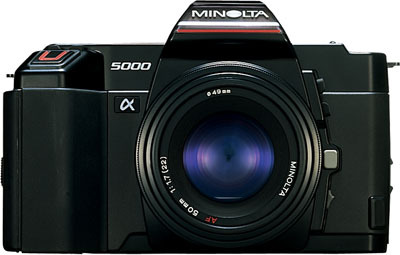 Note the Japanese market name: Alpha 5700i. 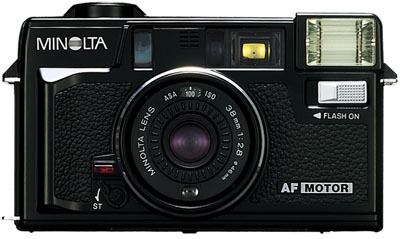 Minolta’s first 35mm AF SLR camera with built-in flash. 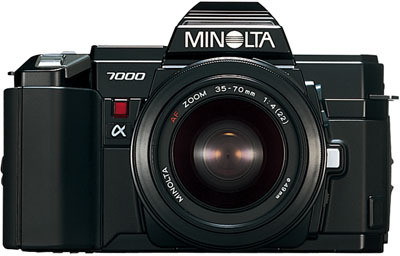 Japanese market model shown – Alpha 5700i.